What about some adrenaline rush in the Tirthan valley ? Whereas the Tirthan valley is primarily known as the gateway to the Great Himalayan National Park, you may want to visit us to find a beautiful and peaceful Himalayan region for your holidays. In this case, you may wonder : "what are the things I can do in the Tirthan valley, and hence how many days should I spend there ? The list of activities given here is not exhaustive of course. But this should give you a fair idea of what you could do apart from leisurely spend you time here and there. Not all these activities are available throughout the year. 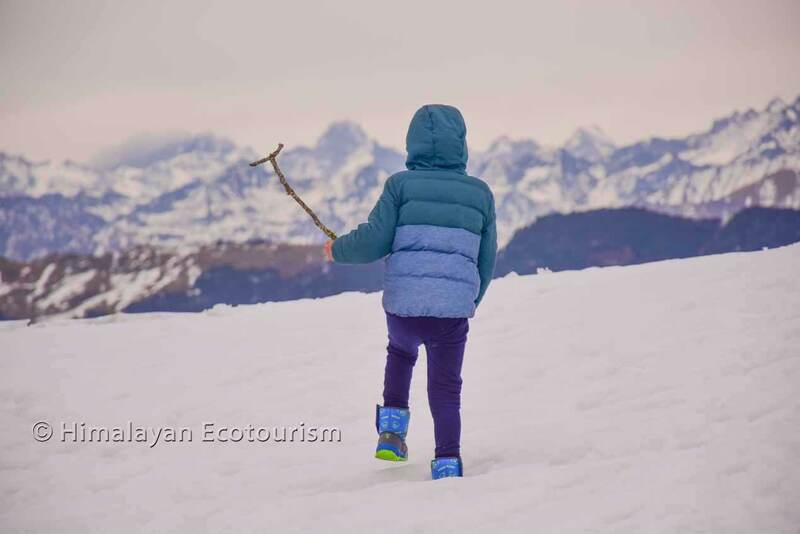 Touching the snow is not possible in summer (except if you trek above 4000 m), rivercrossing is not advised during the monsoon time and camping in winter is not really the best choice. So we give you this information for each activity. Similarly, for each activity, we let you easily know if the activity involves any road trip, if it requires any level of physical fitness, and if you can do it with your little ones. April to June and then September to November. Depending on the trek you will select. Many treks starts from and ends at the village Gushaini. Yes of course. For each trek that we propose on this website you will find accurate information about the required fitness. You can go for most of our treks with kids from the age of 6. The Tirthan valley, with the Great Himalayan National Park, is one of the most beautiful place to trek in the state of Himachal Pradesh. 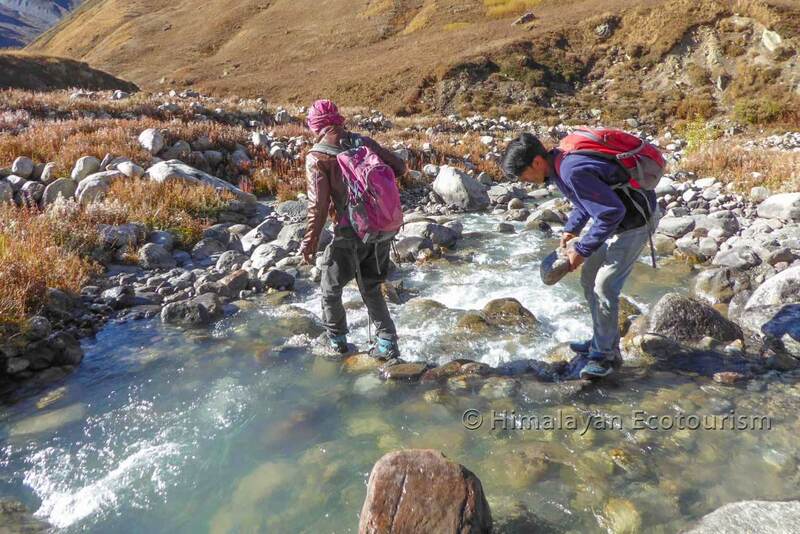 From easy two day treks to challenging ten day trek, there are treks for everyone. 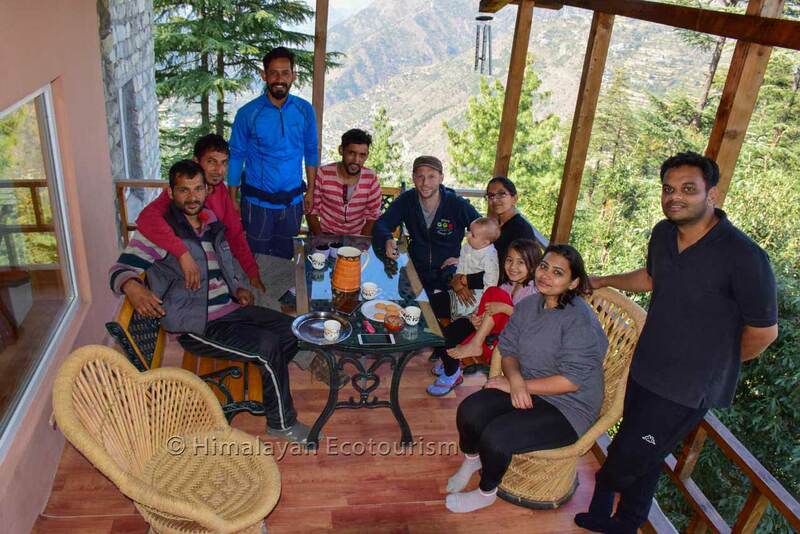 We, at Himalayan Ecotourism, are dedicated to offer the best outdoor experiences to our visitors. Please find here a list of treks that we offer in the Tirthan valley. Want to know how this happens ? Please read this important page. 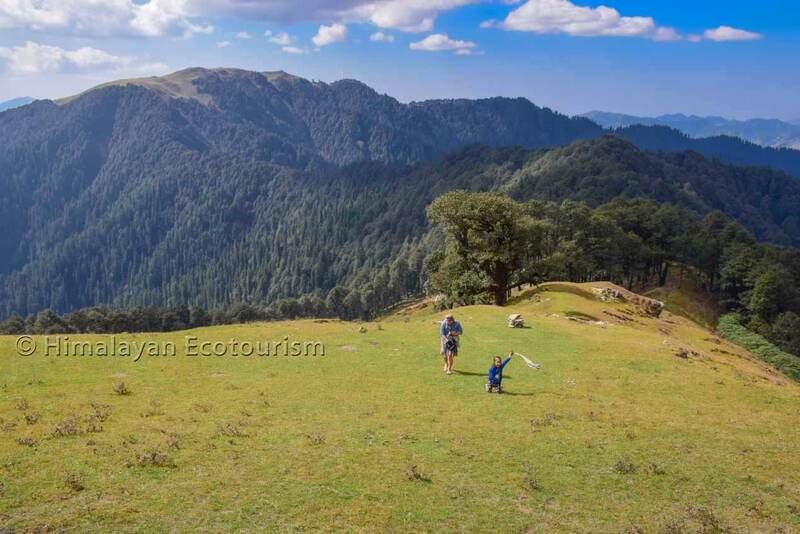 The Tirthan valley originates in the Great Himalayan National Park and hence offers many trek options. With a little effort you can reach stunning places which are not available by road. Most of the day hikes are available round the year. Depending on the hike you will select, and where you stay in the valley, you may have to drive from 5 min to 1 hour. Yes but you do not need to be very sporty to go for day hike. According to your fitness we will suggest the best options. It is definitely suitable for kids. 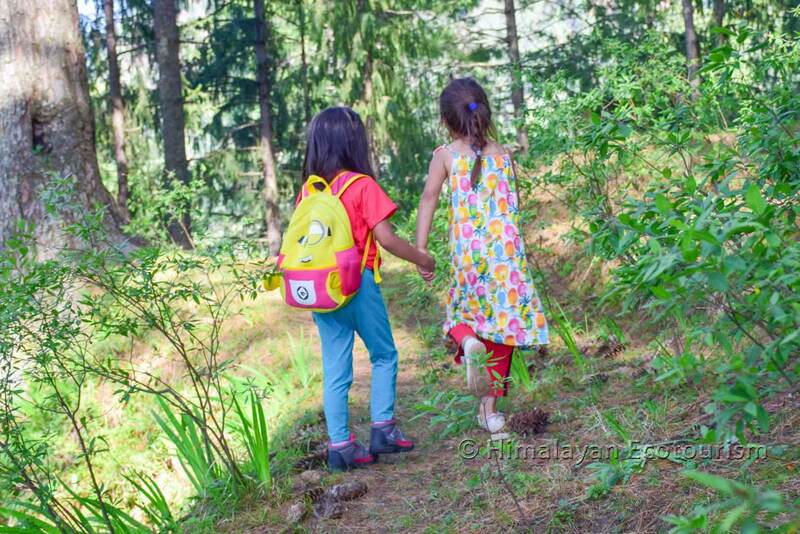 Hiking is excellent for your little ones. If you remain roadside while visiting the Tirthan valley you may miss most of the jewels that it shelters. This being said you amy not want to go for multi-day treks for any reason. In that case you should definitely go at least for one or two day hikes. Hiking will allow you to reach exceptional places for either their natural beauty or for their unique experience of the local culture. We can arrange your guide that will take you on these selected hikes. For your conveninece we will also arrange your packed lunch that you can have enroute. Please find here a list of hikes that we offer in the Tirthan valley. Riverside roads : round the year. Passes and higher roads : from April to December. Here we are talking about road trip only :-). Although we do not want to encourage too much of trafic in the valley, you may spend one day visiting different corners of the valley by car. Please drive carefully and respectfully. As you can see on the map just below, there are not much roads in the valley. Of course the road between Banjar and Gushaini where most of the tourism establishment are located. The road from Gushaini to Pekhri. It has been renewed recently and it is quite spectacular with dozens of loops. The road from Gushaini to Bathad. You can even push it up to Tila Pul on a jeepable road. The road from Jibhi to Bahu offers a great view of the GHNP. The road from Banjar to Jalori pass. It is a very scenic road going through dense forests. A careful and respectful drive can offer you a great experience of the valley. With our supervisory staff you can safely go for unforgetable activities in the wild. River activities are for the summertime only. 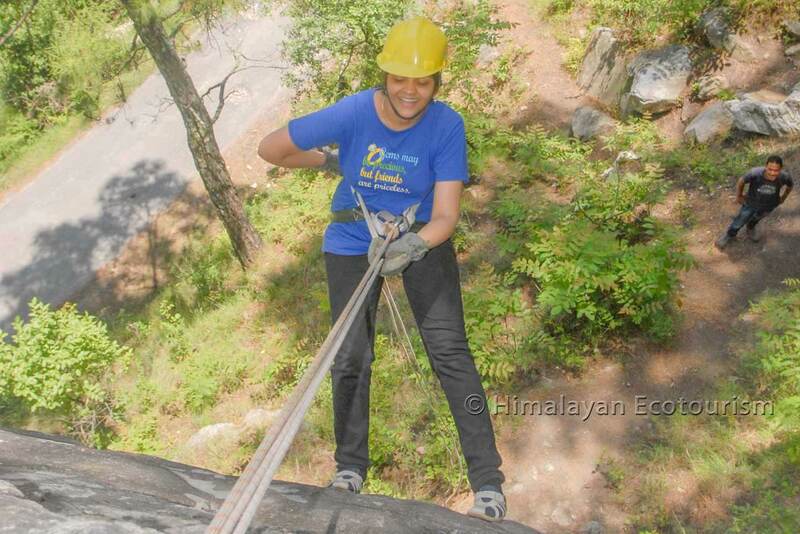 Rock climbing and rappelling are available round the year. There is no fishing in wintertime. These activities happen between Sairopa and Gushaini. You must be in good shape but none of these activities require stamina. Good for your kids above 7 years old. Mountains offer great opportunities for living an adventure. The Tirthan valley is no exception. We can safely organize your adventure activities with an experienced instructor and proper safety equipment. Here are the adventure activities you can do in the Tirthan valley. Please find here more details about adventure activities in the Tirthan valley. April to June and September to December. Yes. You have to move to the place from where you will walk up to the campsite. Yes, as you have to walk up to the campsite in the wild. But some of them are very close (1 km) from the road. Yes, this is an excellent activity for kids. Along with trekking, camping in the wild is one of our favorite activities. You might not have the required fitness for a trek, or whatever the reason,, trekking is not an option for you, but still, you want to truly experience the wild. Then this is a must for you ! Our staff will take you to selected places in the wild with great views of the Himalayas. We have riverside and scenic hill top options. You just have to walk from 15 minutes to 1 hour to reach your campsite where everything will be set up for a comfortable and safe camping experience with our first-class equipment. 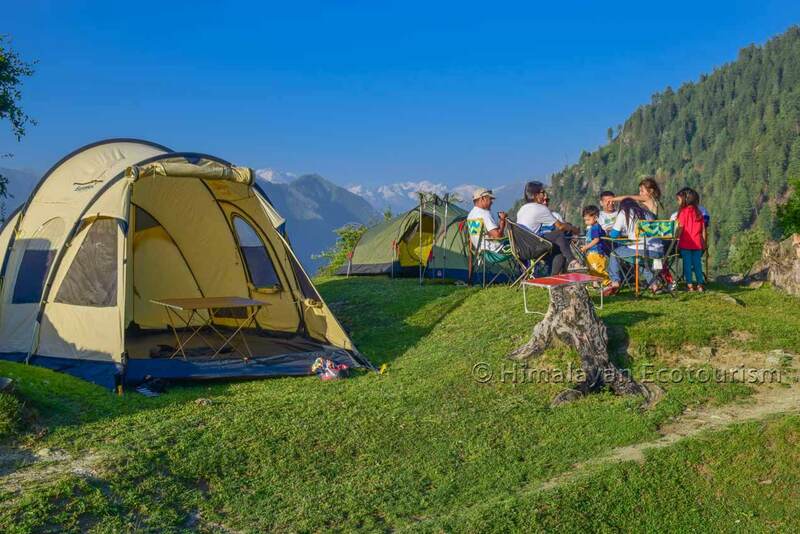 Please find here more details about camping in the wild in the Tirthan valley. Come with us to enjoy the wild leisurely. Visiting a new place must be associated with enjoying the local food. No time in particular except if you want to enjoy eating fresh fruits. Fresh fruits are available from June to September. Feeling bored with the traditional Dal bhat ? Most of the homestay will prepare you fresh local food. Siddu, a kind of giant momo. Fresh fruits like apple, apricots, plums, pears and peaches. There are interesting festivals throughout the year. You might have to move by road and on foot to joing the festival place. Only in case you need to walk to the concerned village/place. 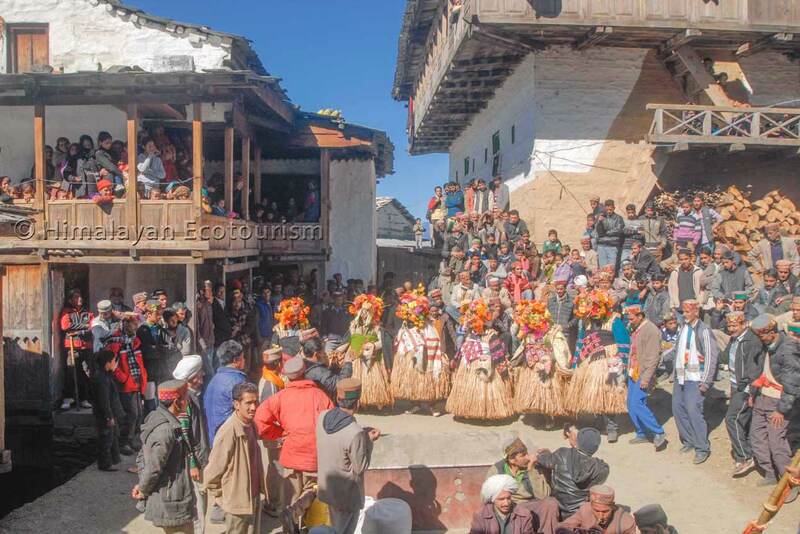 The most important festivals of India are celebrated in the Tirthan valley. But the valley, know as the valley of the gods, has also its own folklore. 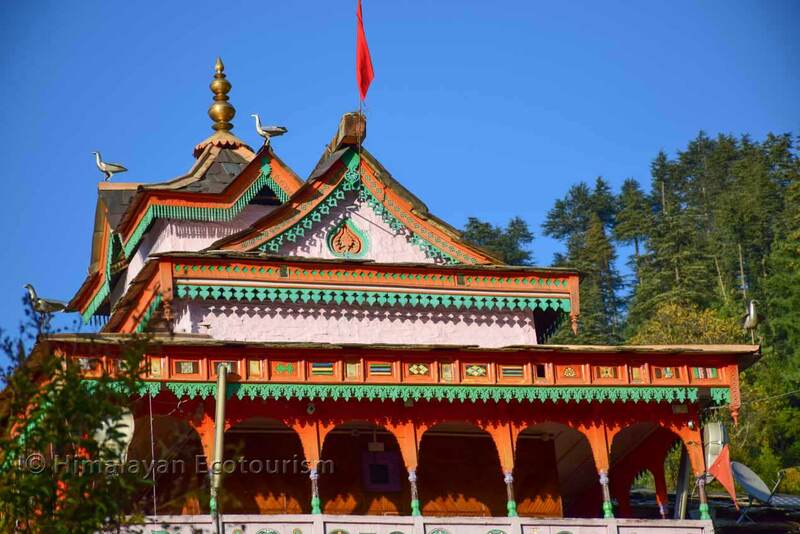 This part of the Himalayas being the cradle of many Hindu mythology legends, some of the festivals celebrated in the entire country, are enjoyed here in a very special way. If there are fixed dates for these famous festivals, you may enjoy anytime in the year all the festivities that happen around the thousands of "Devta", living deities who are used to travel in a very festive mode. Dussehra. At the time of Dussehra, all the Devta of the valley are carried on foot to Kullu. Thousands of Devta are then gathered at the stunning Kullu Dussehra. Diwali. The lights of Diwali beautifully illuminate the mountain sides. Here the Faguli festivals where people dance wearing masks and natural branches as clothes. Nothing more refreshing than going to a waterfall in the heat of the summer. Summertime is best to enjoy the cool environment of a waterfall. You could also consider monsoon time as there will be plenty of water. One waterfall is in near Sairopa, another one is near Jibhi. The Jibhi waterfall is only a 10 minutes walk, whereas the Sairopa waterfall is a 45 minutes walk with some steep slopes. Feeling too hot by the riverside because of fierce rocks in the summer sun ? Why don't you spend some time near a waterfall that will refresh your soul and mind. 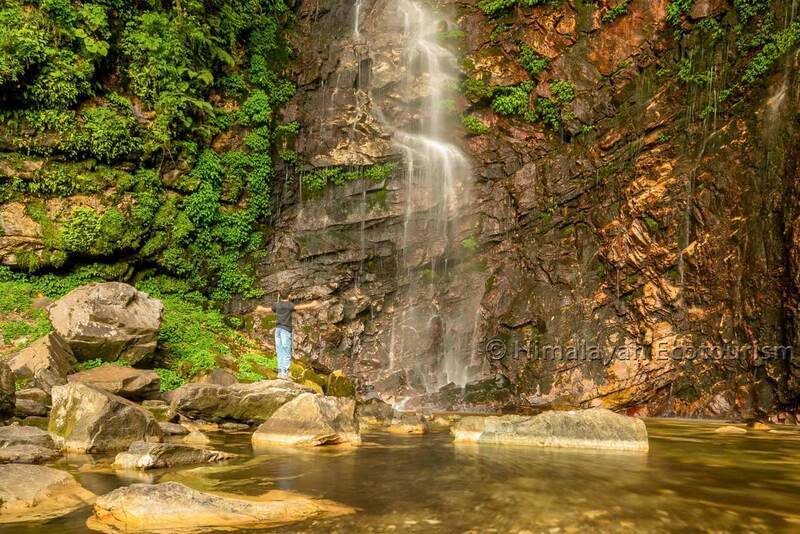 There are two main waterfalls easily reachable in the Tirthan valley. One is the Sairopa waterfall, called the Chhoie waterfall. It takes around 45 minutes to reach there on foot from the main road. The other one is located close to the village Jibhi. It is only a 10 minutes walk to reach. Jalori pass is closed in winter because of the snow. Yes, it takes about an hour drive from Banjar. Till the pass, no effort. But you could go to nearby interesting places on foot. Jalori pass is a nice place to visit because it takes you from the low altitude riverside (1500 m) to higher levels (3200 m). The way to the pass is very scenic and goes through dense forest of Himalayan Cedar (Devdar) and Golden Oaks. From the pass you have a unique views of the Himalayas. Please ask us to take you there and we will take you to stunning places accessible on foot from the pass. Don't forget to take extra layers with you as the temperature drops of around 15 degrees compared to the bottom of the valley. You can go for day hike from Jalori. Either towards Serolsar lake or towards Raghupur Fort. 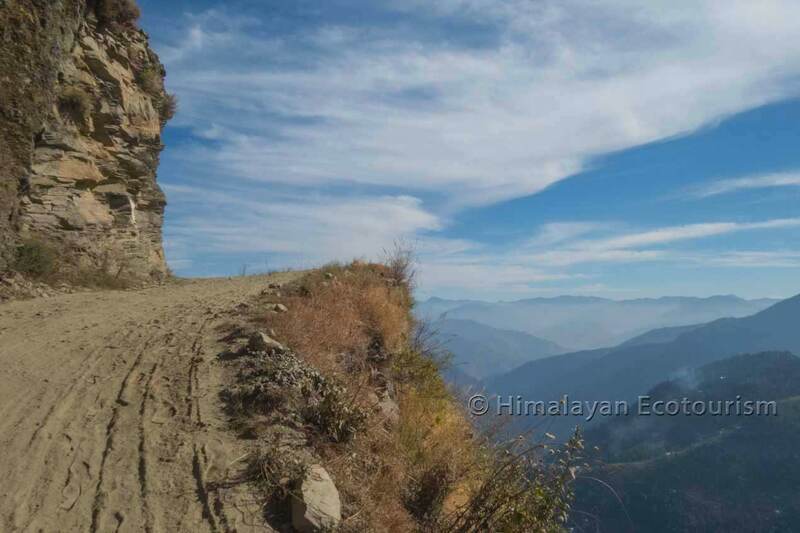 From Jalori pass you should continue on foot to reach very scenic viewpoints. The valley has also a few architectural jewels like this medieval tower in the middle of the forest. Available throughout the year, except during snowfall. Yes, you need to reach the village Bihar from where there is a gentle path going to the tower. Yes it will be a 45 minutes walk with some steep slopes to reach the tower. Coming to the Himalayas to enjoy landscapes, nature and the chilled air does not exclude having some nice cultural experience. Chehni Kothi is a medieval watchtower, built for unknown reason a couple of century before. It is made of stone and wood, without concrete, and yet it has resisted the most powerful earthquake that happen in the Himalayas. It is located in a small traditional village, away from the road. 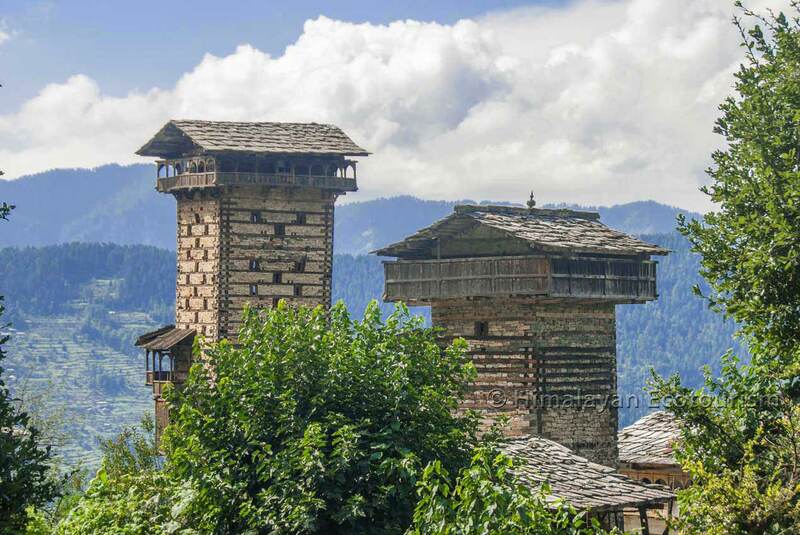 Ask us to organize your trip to Chehni Kothi, we will take you through these beautiful villages and some nice forests to reach this surrealistic place. Birds can be seen anytime in the year. BUT be aware that many birds migrate in winter. Depending on where we will take you for birding. Some exceptional birding areas are accessible on foot only. 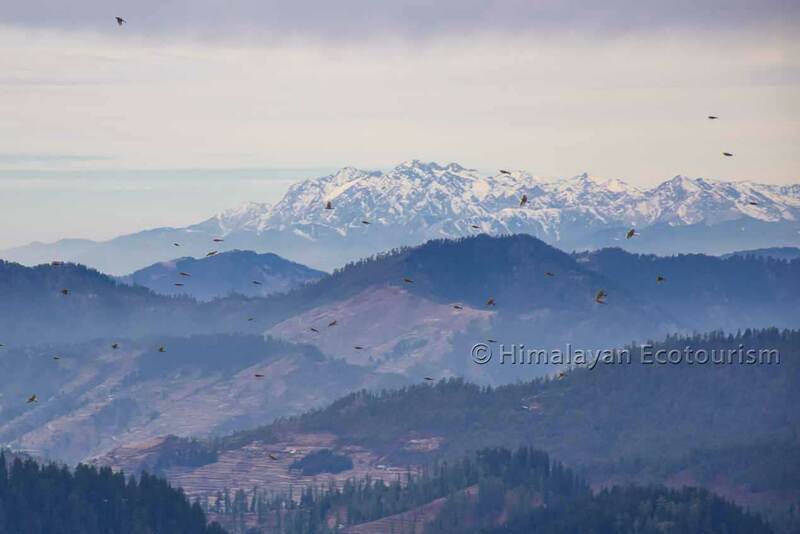 The Great Himalayan National Park and its ecozone in the Tirthan valley are home to hundreds of bird species. The endangered Western Tragopan is the flagship of the birdlife in the area. Our naturalist guides can take you to selected places known as habitat for specific bird species. Rare phesants, vultures, eagles, and so many beautiful birds can be easily photographed with a little patience and expertise. Please enquire with us for organizing your birding tour. Rare species of birds can be observed in teh Tirthan valley with the help of our naturalist guides. Enjoy the snow in a pristine environment. Wintertime only. Best months are from December to March. Depending on the height of the snowline. You may have to go to Jalori pass. India being a hot country where snowfall does not happen in the plains, going to see and experience the snow is always a delightful experience. If you are based in the Tirthan valley in winter you will have the opportunity to easily go to places covered by snow. In summertime that will be more tricky. Only those who are ready to trek to higher altitudes (min 5 days) will be able to reach the snow. Please contact us for any update about the snow conditions in the Tirthan valley. For observing the night sky in open air it could be anywhere above 2000 m for wich you need to go by car. You can consider our camping in the wild for a better experience. You may have to walk in the wild by night. There are no better places on this planet to observe to stary sky than the Himalayas. Either you simply want to enjoy the open air sky for which we recommend you to be above 2000 m height or you want to observe the sky objects with a telescope. In this last case the only place available right now is the Tirthan Eagle Nest homestay. You could also bring your own telescope and then we take care of all the required logistic for setting up your camp in a high altitude site. Please note that even without a telescope, the Himalayan night sky at a high altitude is breathtaking. 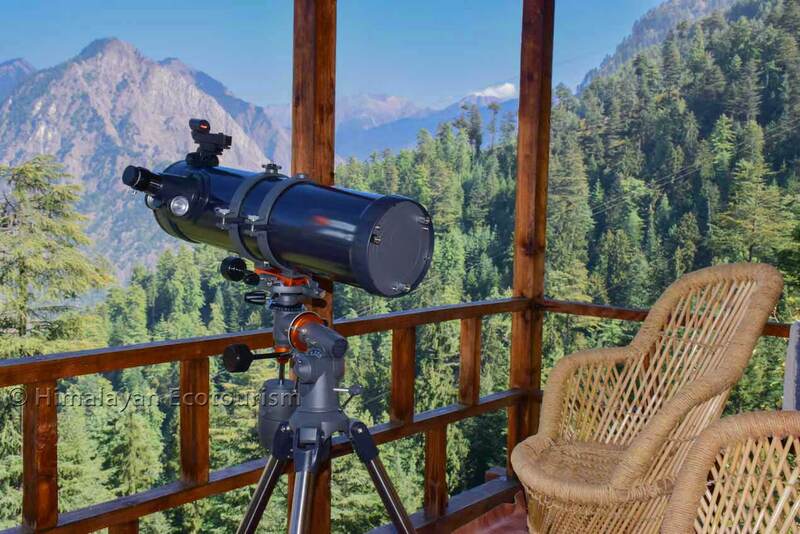 Just camp at a high altitude site or come with us for telescope view of the stars and planets. Obviously there are plenty of temples in the valley of the gods. You may have to go by road and on foot. Yes, for the most remote temples. In case you are interested in the Hindu mythology, the Tirthan valley will fascinate you. Hinduism has so much its roots here that many local Rishi have turned into Devta after they passed awayh. And so, the local people have an unalterable faith into their local gods who all reside in different temples. Visiting these temples are a perfect occasion to sit with the locals and ask them to tell you the story about particular gods. Please contact us for any information about the best temples to visit. Yes, and for some of the homestay you even need to walk to reach. The Tirthan valley is a place to enjoy the beauty and simplicity of the Himalayan life. Staying in homestay is definitely refreshing and very often a great humane experience. Not only you have a place to stay, where the people live, but you also share a bit of the local lifestyle without compromising too much on the comfort. Forget about the luxury and say yes to the experience ! But careful. Many establishments claim to be homestay whereas there are simply commercial institutions. Please contact us for any booking with a genuine homestay. The perfect way to escape our routine and to discover another lifestyle. There are many places where you can fish peacefully in the Tirthan valley. From mid-April to mid-June (best) and mid September to end of October (less fish). The river is accessible by road between Banjar and Gushaini. Beyond Gushaini you need to go on foot. Only if you want to fish beyond Gushaini (on foot). 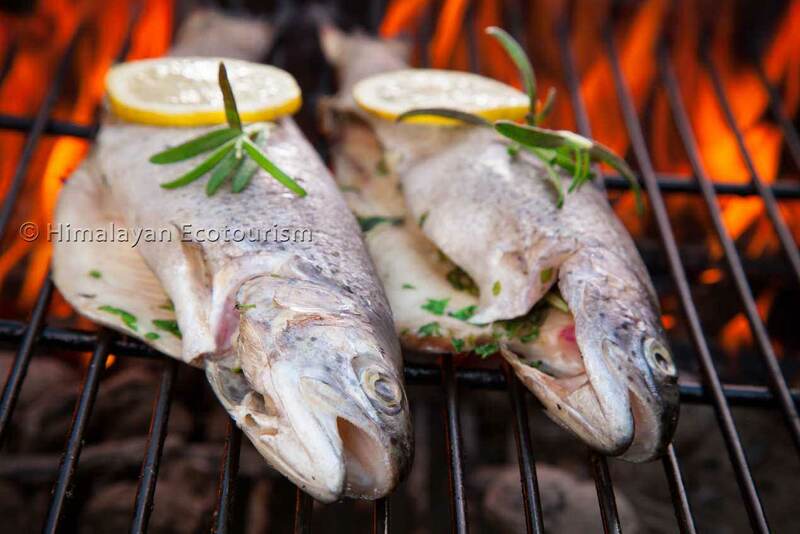 The Tirthan river is well known for its delicious small trout fish. 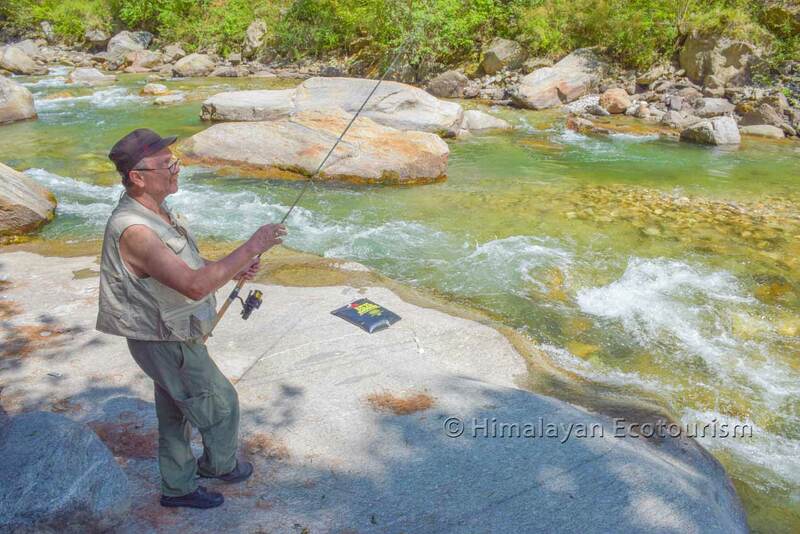 First-timers or experienced anglers simply love fishing in the mountainous environment of the Tirthan valley. We can provide the fishing rods and an instructor to help you learning the best technique. A fishing permit valid for one day has to be obtained form the local administration. We will do that for you, don't worry. Please contact us for any further information about angling in the Tirthan valley.